Trouble Getting Approved in Alaska? It's hard when your credit is bad right? We can help, and in about 10 seconds you're going to see how. Enter your zip and credit score to get started...we got you! See How We Can Help You Get Funded! Summary of Alaska Usury Law(s) / Quote: "Legal: 10.5% Contract: 5.5%; any rate over $25,000 / Judgment: 10.5% / Corporate: No specific rate"
The snippets of interest are from the Alaska legal codes and rules document. Read full document here on their website. Snippet 1.) Quote: § (A): "The rate of interest in the state is 10.5 percent a year and no more on money after it is due except as provided in (b) of this section". Snippet 2.) Quote: § (B) "Interest may not be charged by express agreement of the parties in a contract or loan commitment that is more than the greater of 10 percent or five percentage points above the annual rate charged member banks for advances by the 12th Federal Reserve District on the day on which the contract or loan commitment is made. A contract or loan commitment in which the principal amount exceeds $25,000.00 is exempt from the limitation of this subsection". Click or tap map image above for interactive version. Lenders contact us for listing removal or amendment. Chris just moved to Anchorage Alaska in the last three months to take a teaching job in a local school where he is now living. He loves the weather and the outdoors life so this job is perfect for him. He has already made a circle of friends who spend a lot of time hunting and fishing during the summer. In the winter time they get on their snow mobiles to go across country to visit friends and local pubs for a beer. Only problem Chris has at the moment is that he does not have a snow mobile of his own. He knows that he will need a loan to buy one. He has not worked long enough to build up any savings although he does have a decent credit rating. The only debt that he has is student loans which he has been paying on for the past two years. He is renting a small apartment here and really does not have any other debts. His landlord has told him that he can store a snow mobile in a shed on the property for free. There is also a small workshop he can use if he needs to make repairs. New snow machines can cost well over $10k and then there is the equipment that he will need. Warm clothing and boots will cost another thousand. A trailer to cart it around on would also be helpful, although a buddy has said he could borrow his. Chris has decided that a used machine for $5k and the clothing for another $1k will have to meet his needs at this time. Chris needs a six thousand dollar loan which he wants to repay over three years. His teaching contract is also for three years which fits nicely with this loan term. Although Chris has only been employed in the area for a few months, he does have a long term three year contract with the local school board. Teachers are in high demand in the area and it would highly unusual for Chris not to finish his contract. For someone on the job only for a few months without a contract it can be more difficult to obtain a loan. He has a good credit rating and history of paying his student loan on time. He has a few years before it will be fully repaid. Although he did not want to purchase a trailer, one came available for a decent price, so he increased his loan application to $6500 and it is quite likely that it will be approved. Chris is looking forward to this winter when he can get out on his machine and enjoy the Alaskan winter. His friends have also recommended that he purchase some survival gear in case he is ever stranded by his machine. It is just the thing you do in Alaska. If you live in the State of Alaska and you're struggling with money, we hope our website helps get approved regardless of your credit rating. 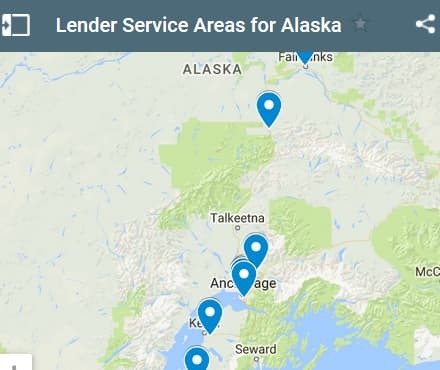 Listed below are the last 5 debt service loans approved in the State of Alaska. Source: WFL Lender Pool. Updated Weekly. Principals rounded to the nearest $1000. Relative interest rates listed below in order left to right. 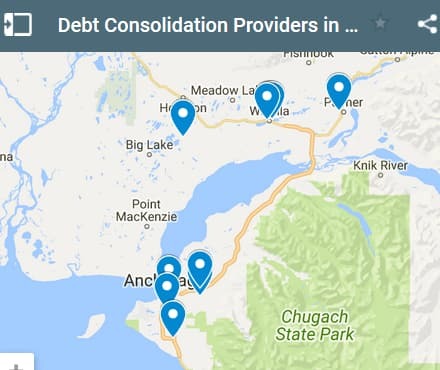 Consolidation providers in the State of Alaska presented on our site are made up of institutional banks, credit unions and private lenders. Before approaching a lender, or opening a dialogue regarding a loan be sure to have all your documentation in order and ready. This saves time for all concerned. For your future personal finances please remember to make sure you have a realistic budget in place before you get your consolidation loan(s). If you don't have your finances in order you may start over using credit cards again and find yourself in even more debt going forward. A lifestyle change is usually critical to your success and being debt free. Rick moved to Seward Alaska a few years ago and has been enjoying the life style that Alaska has to offer. One thing he does not enjoy is that the cost of living is higher than in the lower 48 and he tends to spend more money than he plans on for various items. He travels home every few months to see his family and spends a great deal on airline flights. He charges everything to his credit card and earns points towards airline fares. The more he charges to his credit card the more he earns towards free flights. He generally flies free to see his family at least three times a year. But there is a down side for Rick from charging everything to his credit cards. He is now carrying a balance on his several cards and needs a consolidation loan. Rick would like to consolidate two credit card balances for a total of $7000 at lower interest rates compared to what he will pay on his credit card accounts. While he did save money by getting all these points towards airline flights, he did not manage his spending very well. He seemed to be more interested in free flights than on how much he was actually spending. He now has to face the reality of repaying $7000 he spent and perhaps not receive any more free flights as well. Rick’s situation is actually quite common. With so many incentives these days from credit card companies it is no wonder that consumers like Rick overspend and end up carrying a balance on their credit cards with the corresponding high credit card interest rates. A factor in Ricks favor is that he has always paid his monthly payments on time, even if it is only the minimum payment. His credit score has not been compromised. His credit utilization is pretty high, however once the loan is approved and he repays these two credit cards, his credit utilization will actually improve. Rick will need to be careful in the future. He still wants to visit his family in the lower 48 and use free airline points to pay for the flights. He is very concerned that he will repeat his experience and end up owing a balance on his recently paid off credit cards. One guideline many experts suggest is that consumers should not charge anything to their credit card unless they already have the cash to pay for it when the statements arrive. He is giving his next steps a lot of thought regarding how to manage his spending. His dilemma is whether to lock his credit cards away in his office desk or continue using them to generate airline points. This will be tough for Rick, he really wants to avoid another consolidation loan in the future. 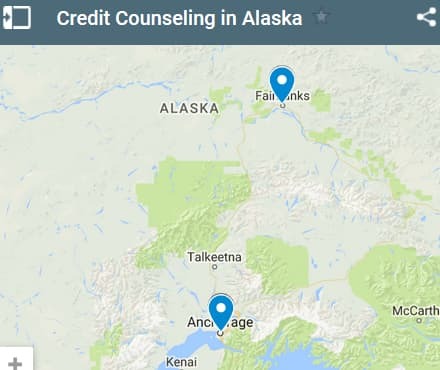 If you live in the State of Alaska and you're trying to get approved for a debt consolidation loan, we hope our website helps you find a good lender and a low interest rate, regardless of your credit score. Andy Somerset is the son of Lance Somerset who founded the We Find Lenders Pool. He writes for WeFindLenders.com whenever he's not working hard on his degree in finance. Counselors contact us for listing removal or amendment.